This was the first of two scheduled concerts featuring pianist Jeremy Denk with Christoph König at the helm of the North Carolina Symphony. It ducked in under the front edge of winter storm Helena. As of this concert, six or more inches of snow were expected. The January 7 performance was canceled. Franz Schreker's Intermezzo, Op.8, programed as the concert opener, was deleted and the intermission was canceled to allow concert goers and musicians to get home safely on roads that were just wet at that point. In spite of the threatening weather, the concert hall was pretty full with those eager to hear two great works of the first third of the 19th century. 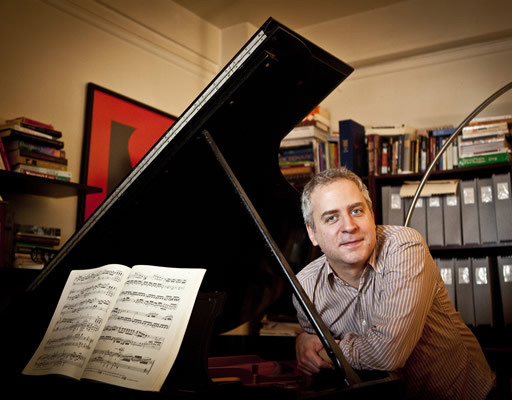 Denk appeared as soloist in Beethoven's Piano Concerto No 4 in G. The winner of a MacArthur Foundation "Genius" Fellowship (awarded to individuals who show exceptional creativity in their field), he has been hailed by the New York Times as "someone you want to hear no matter what he performs." To hear him perform Beethoven was a special treat. The concerto begins with a simple and gentle melody stated softly by the solo pianist. It was magical; Denk's touch was tender and intimate, and the orchestra repeated it in the same style and manner. The opening theme of repeated notes had a luxurious lyrical quality to it that is often missing even in quality artists and orchestras. The expansive first movement unfolded with careful development of themes and clever interplay between the soloist and the orchestra. Denk's technical skill was everywhere apparent: in difficult passages pitting left hand patterns against right hand expressiveness, in lightning fast runs, and in complex cadenza passages. He brought forth sounds ranging from the gentleness of a bedtime nursery song to powerful, almost orchestral force. The second movement Allegro is a conversational interplay between a unison summons from the strings and the gentle, touching replies of the piano. It was intimate and warmly stirring. The third movement Rondo is high-spirited throughout. After briefly visiting earlier themes from the concerto, it gathers its substance together and takes off for the finish line and a rousing joyful conclusion. It was as advertised – a special treat. König is Principal Conductor & Music Director of Solistes Européens Luxembourg. He has toured Brazil and Europe with Orquestra Sinfónica do Porto Casa da Musica. He is in high demand as a guest conductor with renowned American and European orchestras where he has gained a reputation as an astute interpreter of Beethoven's music. After the Beethoven concerto, the piano was rolled off stage and the orchestra seating was quickly arranged for Brahms Symphony No. 1 in C minor, Op. 68. Brahms, a perfectionist by character, was so in awe of Beethoven that felt inadequate to compose in the form that Beethoven so dramatically mastered. At the urging of Robert Schuman, he made an effort to compose a symphony beginning in 1854 when he was just 21. He became dissatisfied with the thematic material as appropriate for a symphony, and instead of an early symphony we have the marvelous Piano Concerto No. 1 in D minor. It was not until 1876 that Brahms, at the age of 43, completed his first symphony. The symphony is a work of sweeping majesty and has been a concert favorite since it's premier. Tonight's performance, though not up to usual NCS standards, was powerful and well received. The counterpoint of the introduction consists of three elements: the tympani beat, a rising figure in the strings, and a falling figure in the winds. It lacked clarity and cohesion. However, once the allegro section of the movement began to take hold, things settled down and fell into place. There were some noticeable difficulties with wind instrument intonation and ensemble later in the work, but these were mostly negligible. There was significant distraction with the storm and driving home concerns. The second movement was deliciously warm and lyrical. Concertmaster Brian Reagan's solo work was extraordinary as usual. The third movement is lilting and lovely; easy-going, but built on complex rhythms and intricate textures. It was very gratifying and nicely done. After a slow introduction, the fourth movement moved along with a sense of excitement. Then there was that magical moment when everything calms down and Brahms gives us the Alpine horn-call theme, after which the hymn-like melody reminiscent of Beethoven's "Ode to Joy" sweept us away. All built to a truly grand finale, a sense of satisfaction and well-being. Thank you, Herr Brahms!